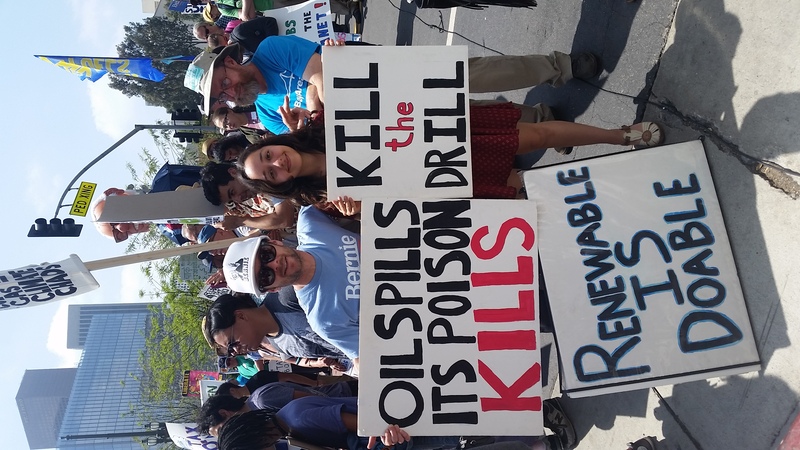 On Saturday, May 14, thousands of Eco advocates convened at Los Angeles City Hall to march against fossil fuels. The “Break Free from Fossil Fuels” march consisted of speeches from both people affected by the hazardous consequences of oil drilling in their communities and ordinary advocates of climate action. There were also musical performances in both Spanish and English. There were hundreds of posters and signs cleverly supporting Los Angeles’s divestment from fossil fuels. 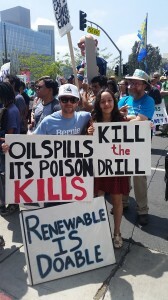 Amanda and Mr. Kay held up signs that stated “Kill the Drill” and “Renewable is Doable”. At 3pm hundreds of renewable energy supporters walked the streets of downtown LA to send a message to elected officials such as Eric Garcetti and Jerry Brown that now is the time to break the chains of fossil fuel dependency. 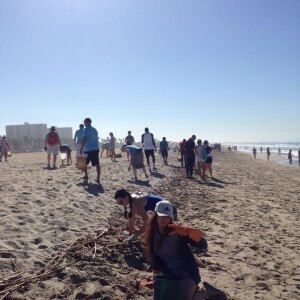 Another successful beach cleanup complete! 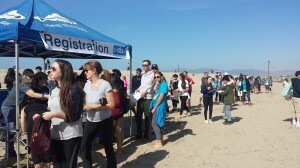 On Saturday May 21, 2016 Team Marine and Marine Biology students attended Heal the Bay’s Nothin’ But Sand beach cleanup at Will Rodgers State Beach along with over 700 volunteers. All in all we ended the day by collecting around 110 lbs of trash off the beach, even though people were comme ting about the beach already looking trash free. Thank you to all the volunteers!!! On Thursday, April 28, 2016, Amanda and Christa represented Team Marine and Santa Monica High School at the annual Streets to the Sea Challenge put on by Generation Earth. 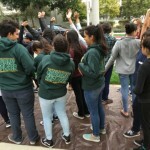 Five middle schools and five high schools traveled to Disney Synergy Lab in Glendale to display their environmental projects. 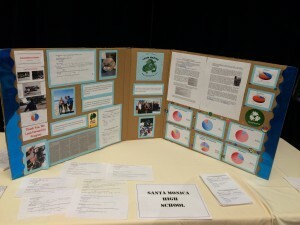 The students were asked to create and implement a water-wise solution to a problem present on their campuses. Team Marine submitted their water fountain audit to enter the competition. The day started off with breakfast, a presentation from one of the judges, followed by a walk-around display of students’ projects, lunch, another presentation, and lastly awards. Each school was asked to make a tri-fold display of their project. Team Marine repurposed an iMac box into a tri-fold poster board. We included pi charts of our data, photos of water fountains, and slides from our presentation to the sustainability coordinator of our district. 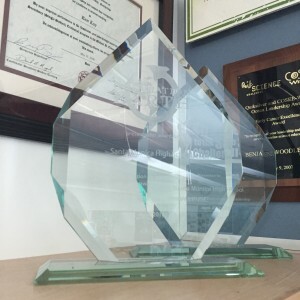 Every school received a glass trophy for making it to this stage of the competition, but only one middle school and one high school received the grand prize of a boat trip on the Floating Laboratory. Both Santa Monica High School and El Camino Real High School received the same score from the judges, but El Camino was the ultimate winner. 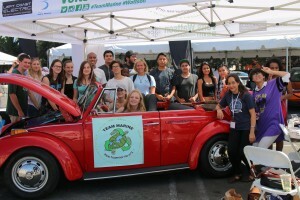 Team Marine would like to congratulate El Camino Real High School for the success of their grand-prize winning project. We would also like to thank Generation Earth for putting on the competition and choosing us as finalists. On Saturday, April 23, Team Marine members joined hundreds of dedicated volunteers as part of the Great LA River Cleanup. 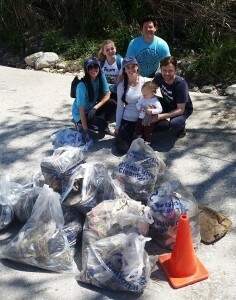 This event was hosted in conjunction with Friends of the Los Angeles River and the Frog Spot. When we first got to the event, we were warmly welcomed by Frog Spot volunteers, who gave us sturdy gloves and transparent trash bags. 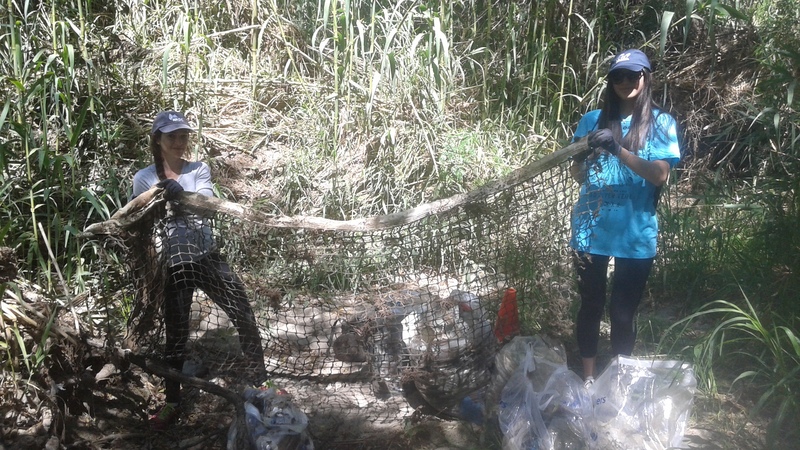 When we initially started cleaning, we were shocked that the LA River was not concrete as we imagined, but actually an overgrown bamboo forest. We were even more shocked when we began collecting trash! 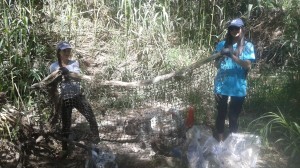 Some trash highlights included a complete tennis net, clothes, and shopping carts embedded into the soil. Even more stunning were the sheer multitudes of photodegraded single-use plastic bags incorporated into the soil. 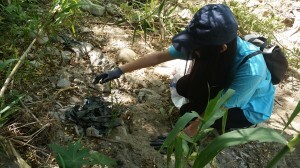 Team Marine member trying to dispose of a photodegraded single-use plastic bag. We postulated that we could spend the whole time spent at the cleanup in one area, and still not fully clean it! This is so concerning, as the trash from the LA River goes straight to the ocean! Just imagine the harm just the trash featured above would cause to the already fragile marine environment. Trash Team Marine members collected. Team Marine co-captain Zoe Parcells was also featured in an interview with La Opinion! Read more here. We had an extraordinary time interacting with the environment of the LA River, and would not hesitate to clean it up yet again! 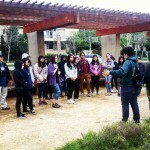 We also had a great experience with the Friends of the LA River and the Frog Spot! Check out their websites at folar.org and The Frog Spot! Team Marine is proud to partner with Surfrider’s Ocean Friendly Restaurants (OFR) program! The goal of Ocean Friendly Restaurants is to reward restaurants for their beneficial practices. Team Marine members have begun contacting local restaurants to inform them of this great opportunity. Perks of being an Ocean Friendly Restaurant include decals, informational materials, social media promotion, training of staff, and much more! Many restaurants already qualify for most, if not all, OFR requirements. 3. Water conservation efforts such as saving water in a drought, no hosing down outside without capturing the water to reduce urban runoff, and/or proper disposal of FOG (fats, oil and grease) to conserve water and help reduce sewage spills. 4. Plastic straws are provided only upon request. 5. Only reusable tableware is used for onsite dining and utensils for to-go food are provided only upon request. 7. Discount offered for customers with reusable cup, mug, bag, etc. 8. No plastic bags offered for takeout or to-go orders. 9. Organic, local, and/or vegetarian/vegan food options are offered on a regular basis. All seafood must be a ‘Best Choice’ or ‘Good Alternative’ as defined by Seafood Watch. If a restaurant implements all 10 of the qualifications, they are designated as a Platinum Level Ocean Friendly Restaurant! Yesterday, Team Marine attended an OFR training session at the TOMS flagship store in Abbot Kinney. 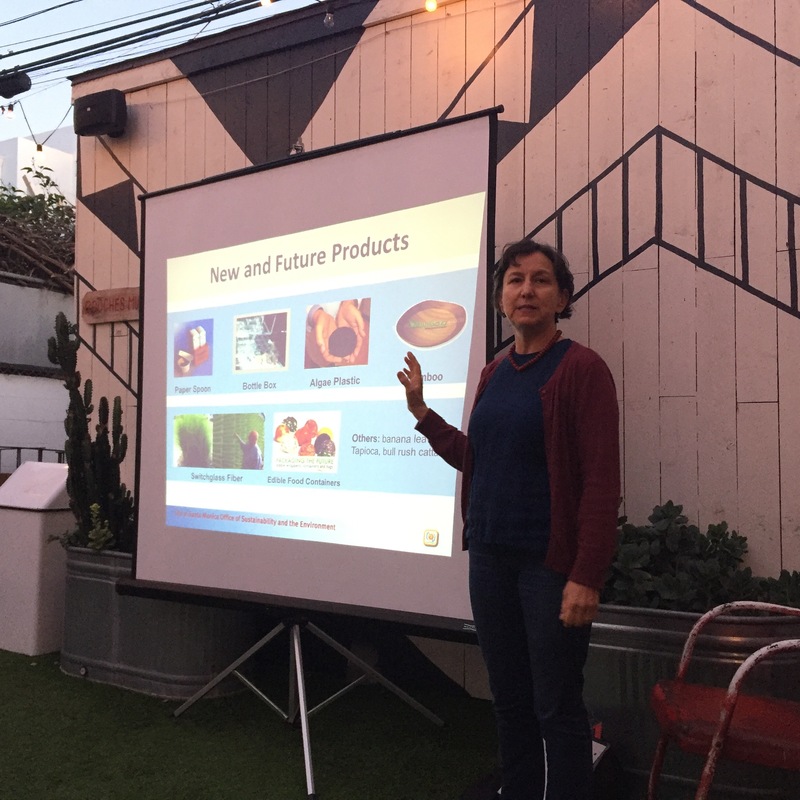 We met with Josephine Miller from the Santa Monica Office of Sustainability, who gave a great presentation on recyclable food containers. 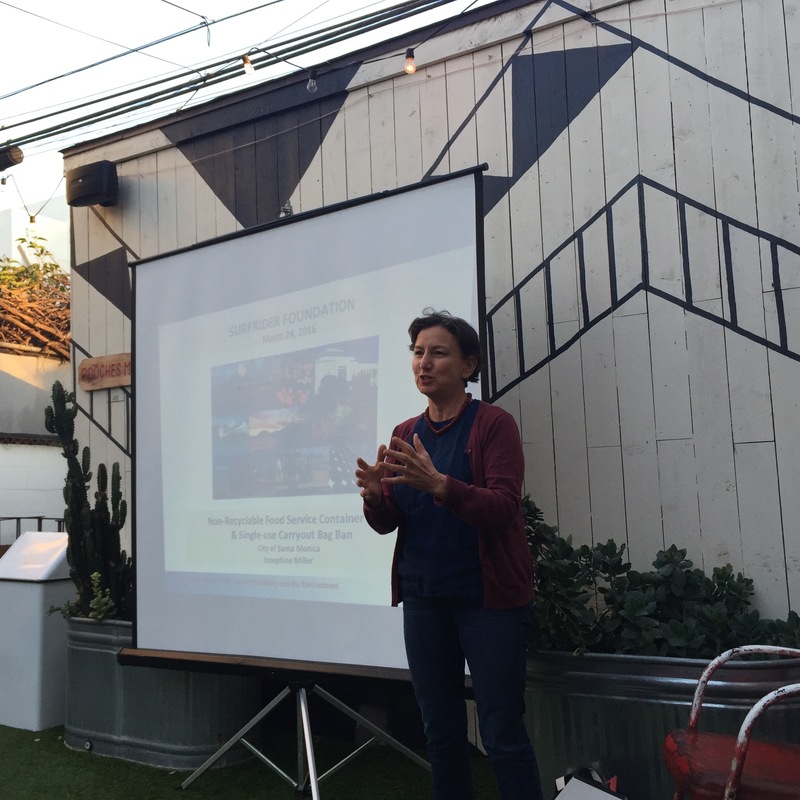 Team Marine was educated on new nationwide OFR criteria and proper recycling practices for restaurants in Santa Monica. Some information gleaned from Josephine’s presentation included examples of transitions from plastic packaging to paper packaging, even in franchise restaurants! Additionally, we learned that bioplastics (under #7) are not able to be composted with Santa Monica’s current program — as of now, they need to be composted in a special process. Interestingly, plastics with no number are actually the banned polystyrene (#6). We were happy to learn that Santa Monica aims to be a zero-waste community by 2030, with 95% landfill diversion! Restaurant patrons: you are also allowed to bring your own reusable takeout containers and pack your leftovers yourself — no intervention from the kitchen needed. For more information regarding Ocean Friendly Restaurants, contact a Team Marine member or Surfrider-WLAM chair Emily Swallow at eswallow@wlam.surfrider.org. On March 5, 2016, two Team Marine members, Amanda and Christa attended the Blitz the Bay Youth Summit put on by Heal the Bay. The summit took place in Playa Vista near the Ballona Wetlands. The purpose of the summit was to get youth to explore biodiversity and become involved in BioBlitzing, in which a group of people go to a particular area and record species. We were trained to use a new app called iNaturalist to help us BioBlitz. We used the app to record different plant life around the Playa Vista park. 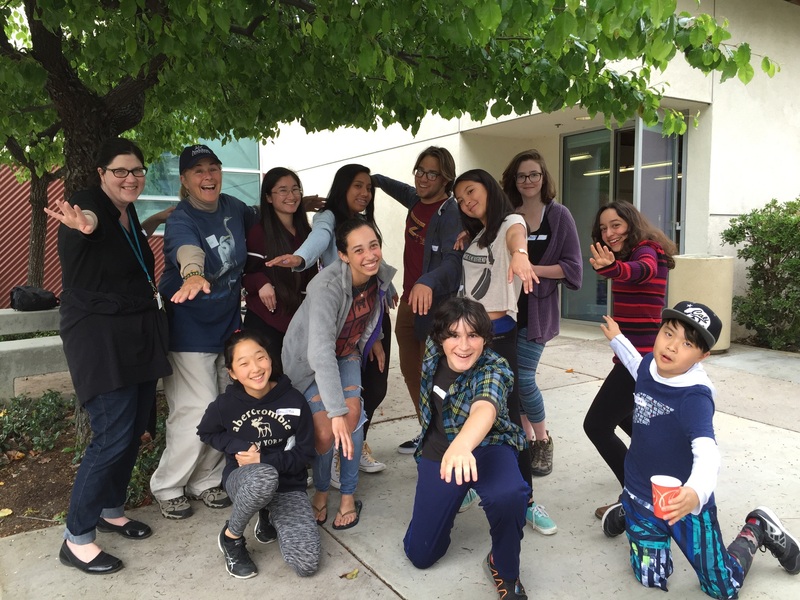 Near the end of the day, some members of the Heal the Bay club at Samohi taught us how to do the BioBlitz dance. People are posting videos of this dance (to DJ Snake’s song Bird Machine) to enter the The National Park Service BioBlitz Dance Challenge. 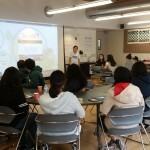 This summit was in preparation for Heal the Bay’s upcoming Bio Blitz events and for their club challenge. The club or group to get the most species tagged or the most observations on the iNaturalist app wins the Blitz the Bay Club Challenge. 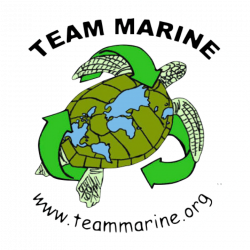 Team Marine plans on participating in this challenge. We would like to thank Heal the Bay for inviting us to the summit and we look forward to attending their BioBlitz events. 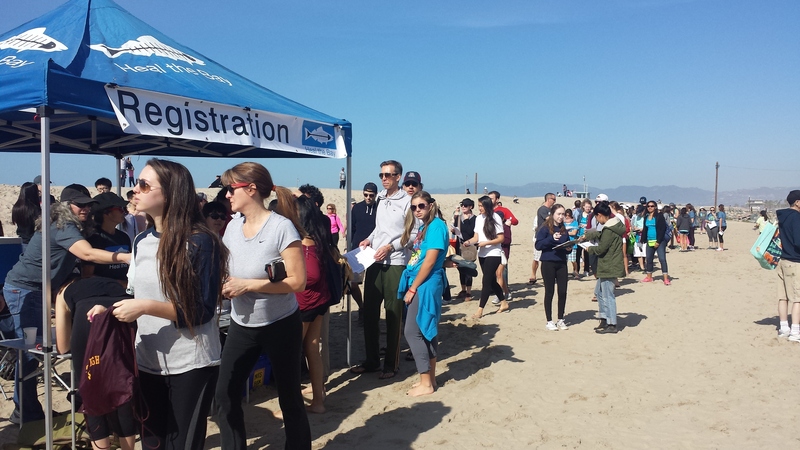 On Saturday February 20th, a couple of Team Marine members attended Heal the Bay’s ‘Nothin’ But Sand’ beach cleanup at the Venice Beach Pier. The turnout was amazing, with over 1077 people, and the amount of trash that was collected was even more impressive which was measured at around 292 pounds! As we were scanning the beach we noticed that there was a large amount of plastic bottle caps, small pieces of styrofoam, cigarette butts and plastic straws. One of our captains, Zoe, took photos of the straws we collected for her other club (Reducing Straw Pollution). We also met two 8th graders from Lincoln Middle School who we ended up talking with about what we do and hopefully convinced them to join their freshman year! Cigarette butts were one of the most abundant litter found on this beach, probably because there was rain a couple of days before and they most washed down from the streets. 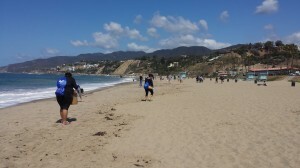 We spent 3 hours cleaning, and because of the sheer amount of people who showed up, we picked up even the microsystems and the beach looked absolutely beautiful! 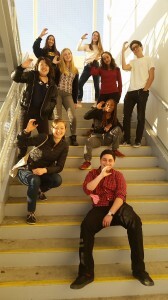 On February 5th, 2016 Team Marine was delighted to have Hadley from #climatesign (climatesign.org) come to our meeting to talk to us about the “peace sign of this era.” The climate sign is hand gesture in which the fingers form the letter C, which simply stands for “climate.” Individuals can raise the climate sign as a symbol for the progression to a world without the damaging effects of climate change. One can raise the climate sign when seeing someone recycle, ride a bike to work, or drink from a reusable water bottle. We talked with Hadley about some new ideas that would allow the climate sign to become more well known by the public. Such ideas included the production of stickers, pins and patches, the creation of art murals, and many more. Team Marine is extremely excited about seeing the future of climate sign. This small gesture can consciously remind individuals that changing the Earth for the better is a daily and habitual practice, as well as encourage others to start or continue environmentally beneficial practices. So, don’t be surprised if you see someone raising a C next time you bring your reusable bag to the grocery store. 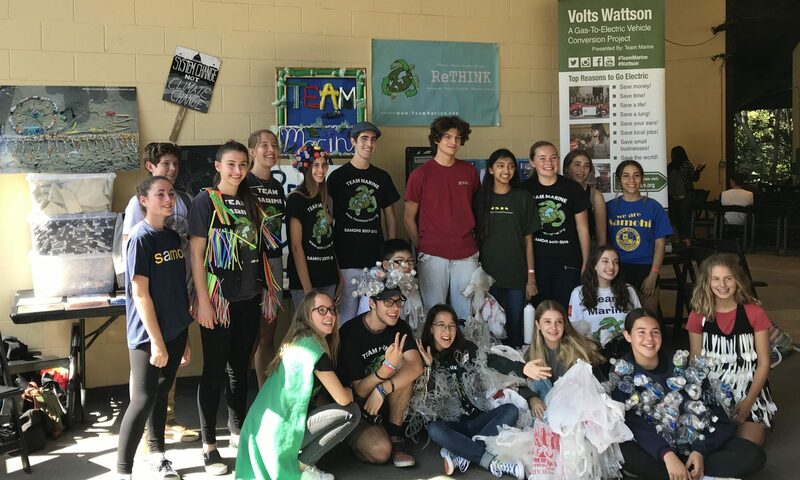 On Saturday Sept. 20th Team Marine and Marine Bio/Environmental Science students, left the Heal the Bay Coastal Cleanup Day and ran straight to the Santa Monica Civic Center to show Volts Wattson. We spent the beginning of the day speaking to people at the event and showing off the new upgrades to the car. Later that day we left a few members to stay outside with the car, while the rest of us went to watch a panel of environmental celebrities talking about a new movie coming out this spring, My Lunch With the President. Mayor of Santa Monica Kevin McKeown introduced the panel which included Paul Scott, whom the movie is highlighting, Kelly Olsen, the amazing director, Ed Begley Jr., famous environmental actor, John Densmore, former Doors drummer, and Alexandra Paul, actress and co-founder of Plug in America. All these eco-warriors expressed their love for electric cars, describing their “first times” driving in an electric car among other things. The panel also discussed the movie, after we watched the 8 min teaser. We cannot wait to see the movie! Thank you to Alt Car for hosting this amazing panel and for allowing us to showcase our car again. Also many thanks Wells Fargo, Left Coast Electric, the City of Santa Monica, and all of our partners! 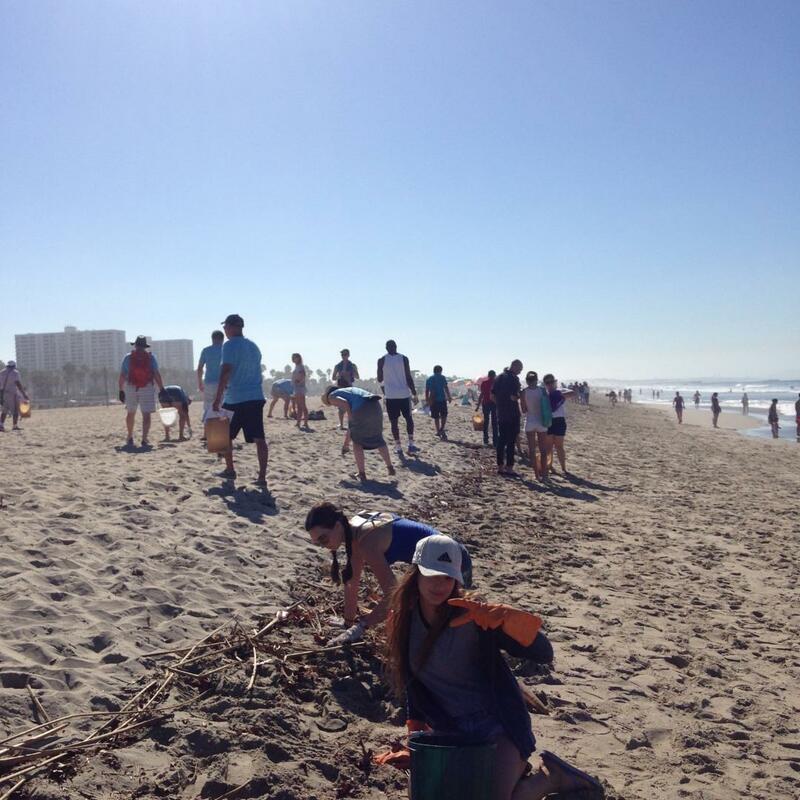 On Saturday, September twentieth, Team Marine members attended a Coastal Clean-up Day beach clean up hosted by Heal the Bay. They along with a large group of peers spent three hours scouring the area between lifeguard station twenty and twenty-seven for trash. The most aggravating aspect of this event was the blatantly negative of human’s on the environment. After the first rain of the season it was particularly easy to see the sheer quantity of items people in our community have carelessly discarded. The sand and sea were overwhelmed with littered cigarette butts, Styrofoam chunks and plastic straws. Each of these items were broken into tiny pieces and scattered along the shore. Completely clearing one square meter of space could take fifteen minutes. While this injustice was disgusting in aesthetic, what is most concerning is that we could not pick up every piece. Many of the pieces were miniscule, making them impossible to locate and easy for marine organisms to accidentally consume. The toxic chemicals in litter, specifically plastic particulates, will surely cause a rift in the marine ecosystem; and therefore the biodiversity and food it currently provides. While this realization may have caused some dismay, this event was personally motivating because we were able to be part of the mitigation of the issue of plastic pollution. The issue itself has been discussed on many occasions, and it was of course reaffirmed in the emails preceding the event. However, this event was crucial in the way that it allowed people to see firsthand the effect of humans on the environment. 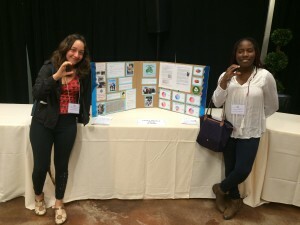 A large part of achieving environmental peace is moving towards sustainable habits, and the things we saw at this event were definitely motivators for change.